Puffie goes snorkelling « « » » Lost the boat? We arrived in Key West just before dinner last night. We are staying with Jim, who we met on Warm Showers. We had a delightful dinner at a local beach restaurant while watching some of the “local entertainment” on the beach. Unfortunately, due to its temperate climate, there are a fair number of homeless who make their way to Key West, and several of them got into a brawl shortly after we arrived at the restaurant. Fortunately, there were a few folks around who were willing to break up the fight. Jim has done a fair bit of bike touring, and other interesting things in his life, and is planning another bike tour shortly. We had a chance to learn a bit about his story after dinner. He started out in the Navy after High School, working in San Diego, then moved to San Francisco after his discharge. He has also worked in Yosemite, and has spent the last 10 years in Key West, watching it change and grow. He has managed all this while being HIV positive for more than 20 years, which not too many people can say. Now HIV in North America gives you the same life expectancy as Type One Diabetes (which my father has survived for over 40 years now), but that certainly wasn’t true 25 years ago. At that time, HIV-AIDS was mysterious, and seemed to be eventually fatal for everyone. 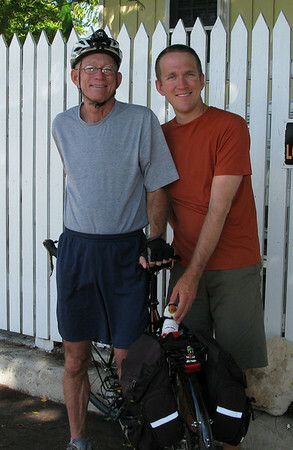 Jim left San Francisco to travel by bicycle after being diagnosed, and he attributes the travel, exercise and serenity he gained through cycling for helping him in the early years of his illness. For decades, Key West has been a refuge for gay tourists, and was also an area hit very hard by the AIDS epidemic in the 1980s. The complex where Jim lives is a testament to that. It is called “Marty’s Place”, and was established in 1990 by composer Jerry Herman in memory of Marty Finkelstein, as a home for people who are HIV positive. We waved to a few of the residents, but we left on Sunday morning, so didn’t get a chance to meet any of them and hear their stories. Two days certainly isn’t long enough to really get to know anyplace, and Scott felt that we were rushing through our trip to the Keys, but we had things to do back in Hollywood on Monday, so didn’t feel we had much choice. Before Jim headed out for a training ride, Puffie got a chance to meet Marvin the Martian (Jim’s mascot), and to pose for a photo. After packing our gear, we headed to downtown Key West to check it out. It was oppressively hot (over 95 deg F and humid). We have not yet adapted to the heat, so weren’t happy being out of the air-conditioning for any length of time. It is very good that we choose not to bike! After a nice lunch at the Banana Café, we went to check out the Key West cemetery. Because everything on Key West is close to sea level (the highest place is only 12 feet above sea level), a lot of the burial plots were above ground tombs. It was neat seeing the family burial plots with tombs stacked 2 , 3, and even 4 high. Becky wonders if there is a building ordinance that limits the height of any given plot? After our tour of the cemetery, we decided to head up to Key Largo to enjoy an afternoon by the pool and a nice dinner in celebration of our sixth wedding anniversary. Just as we were getting into the car, Becky accidentally dropped Puffie, directly into a mud puddle! It was a good thing we had a bottle of water in the car. Becky was able to give Puffie a nice warm shower. Puffie now isn’t quite as muddy, but looks like a pretty bedraggled Labrador Puffin (scruffy Puffie). We hope he will dry out OK. It was nice to see the Keys weren’t as heavily developed as other coastal areas we have been to – still lots of low-rises and small homes, and very few buildings taller than 3 stories. Some of that may be due to the relatively recent ‘discovery’ of the Keys as a destination, but also related to infrastructure constraints. All the water for the Keys comes down from wells near Florida City via a 130 mile Aqueduct, although there are two desalination plants for emergency use. This entry was posted on Sunday, September 28th, 2008 at 6:41 pm	and is filed under Florida, Journal, United States, Visited Places. You can follow any responses to this entry through the RSS 2.0 feed. You can leave a response, or trackback from your own site.